Welcome to Sundbyholms Slott for conferences, weekend, parties and weddings. Sundbyholms Slott is attractively placed by the southern shore of Mälaren with Eskilstuna 10 km (appr. 16 miles) south and only an hour to Stockholm. As beautiful in summer with a long sandy beach and praised marina, beech forest and golf course as during the winter months dressed is snow flakes, ice skating rink and warm fires in the castle. Our kitchen is recently renovated in the aim of placing even more force into the culinary experience, which we already valued highly before. The restaurant also features a cosy garden. All bread and pastries are baked in the bakery of the castle. Why not add another aspect to your conference with a themed dinner? We can offer viking dinners in the vaults, regal 18th century masquerades or vibrant mystery dinners à la Agatha Christie. In 2010, the venue was both Nordic Ecolabelled and designed to accommodate disabled persons. 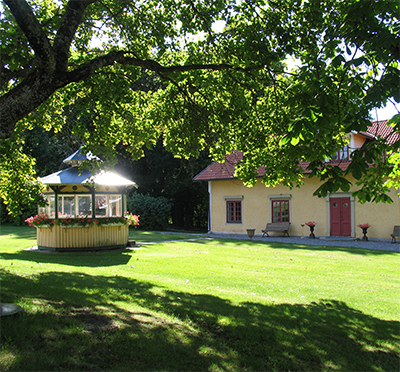 It has in the past years also pinned itself to the geographical realm of TV with the shooting of TV4's reality show Bonde Söker Fru taking place at Sundbyholms Slott 2007-2009. With modern conference facilities, four-star accommodation and service-minded staff, our guests are wished warmly welcome. Have you been to Sundbyholms Slott and want to give your own comments?